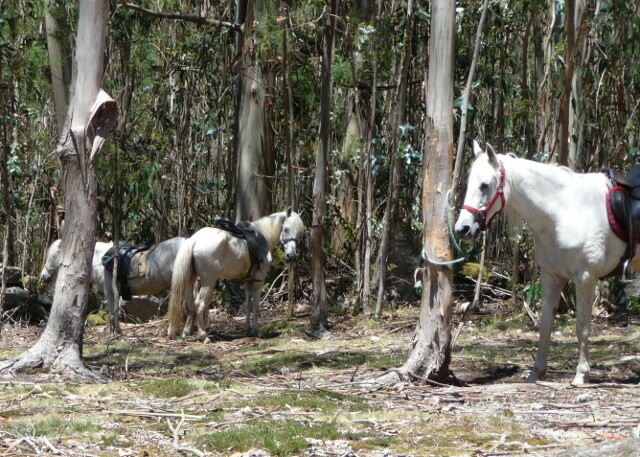 Wild horses dragged us out of bed early on a Sunday morning in Baiona after all. 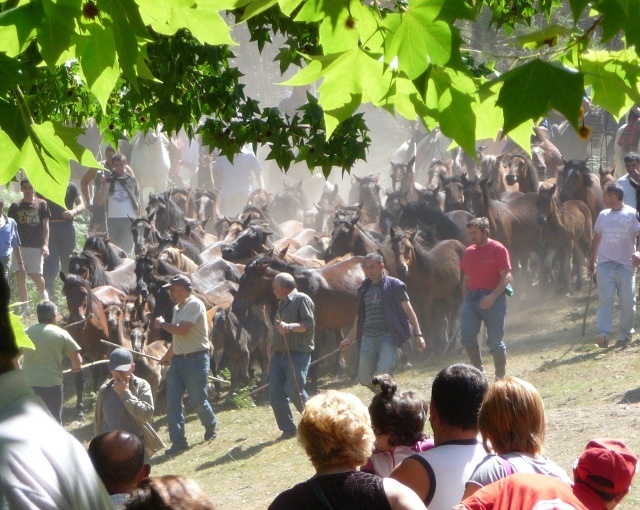 We’d heard about curros – local round ups of wild horses with associated partying – in certain areas of Galicia in May and June on Sundays. Of course, we had to find one, which proved trickier. They are not a tourist thing at all (I think we were the only non-locals present) and as lovely as the Spanish tourist information women are – they only have information about their immediate area, village even. In Santiago though, once we’d discovered how to pronounce ‘curro’ with a real rolling of the ‘rrrrr’ we got a list of curros for forthcoming Sundays. We found one in Morgadans, near Gondomar in south west Galicia, close to the Portuguese border and a stone’s throw from where we were roughly planning to be anyway. Finding out more about exact location and timings proved harder with conflicting information. With almost no signs in existence, we took a few wrong turns in the back lanes but after asking local villagers and finding some cars to follow, we found a clearing up in the eucalyptus forested hills, set deep in a hollow forming its own amphitheatre. Dozens of riders went out to round up the wild horses first thing in the morning, corralling them further up the hill at first. Riders of all shapes and sizes, men, women and children take part, with the prowess and posturing of a few of the young and not so young men very much on show. 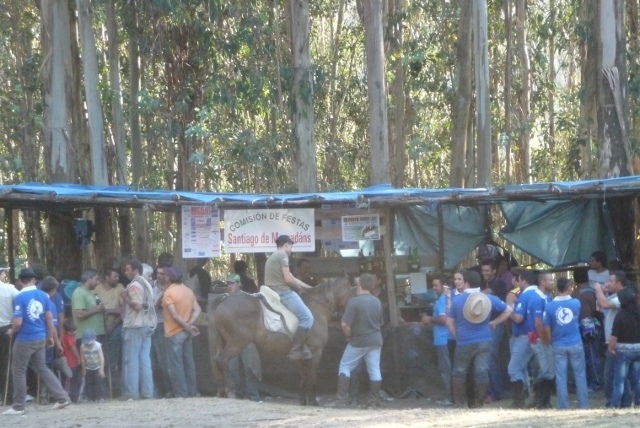 In the meantime, hundreds of locals showed up and partook of the wonderful makeshift bars set up around the clearing, the smoke and flames from their crackling ‘churrasco’ barbecues mingling with the dust from the masses of horses being ridden back and forth with the sunlight filtering through. The cooking smells of the slabs of ribs and chorizo blended with the strong fresh scent of the eucalyptus trees… and the smell of horses. The palpable buzz grew around midday as we waited for the horses to be brought down to the corral. The 60 or so horses arrived and almost straightaway the 15 or so foals were manhandled into a separate enclosure. Then nothing happened for quite a while. It was lunchtime of course – so there was a three hour gap where people chilled out – the horses and riders relaxed at their encampments in the trees and people picniced or enjoyed the bars. The action later was in the main pen where the horses were lassoed one by one – sometimes with great difficulty and drama, and then dragged off for spraying with disinfectant, the younger adults were branded, some had shots and some were selected for mane and tail trimming. They were then let loose to go back off into the forest once more. 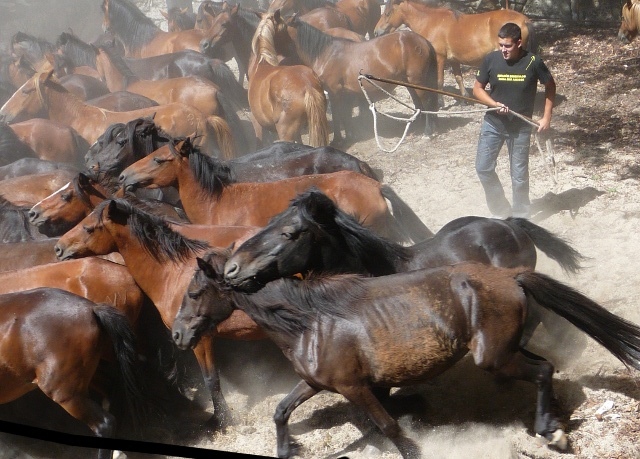 Some horses gave their handlers a very hard time… kicking and bucking… and a couple got away and made a dash for the hillside into the throng of spectators, and we came close to being trampled on. When a wild horse, whites of eyes showing, nostrils flaring, mane and tail flying is galloping straight for you, it’s hard to know which way to run without getting in the way of the men chasing to catch it. Miraculously no one was trampled or hurt in any way and it all added to the excitement of the afternoon. As with any event involving animals overseas, the standards of animal welfare did concern us. 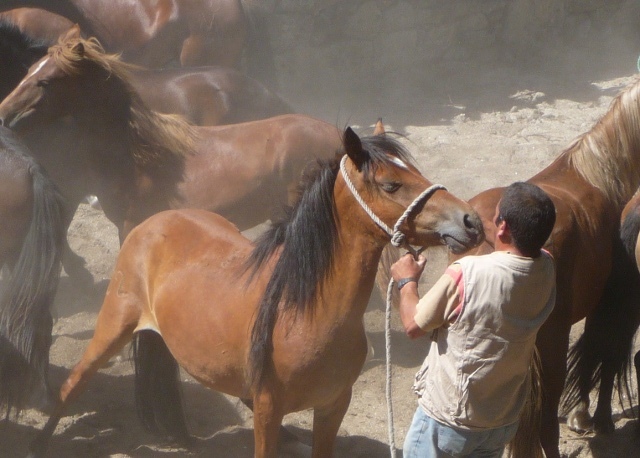 In this case, the wild horses and their foals being penned up for a long hot day (more than eight hours for some) without food or water, and the treatment some of the ‘wilder’ ones received when they got the better of their handler. One chap beat a horse so hard his stick broke – much to the vocal abject derision of the crowd and his fellows though. A couple of mares and foals were kept aside and taken for further veterinary attention once everybody had left. 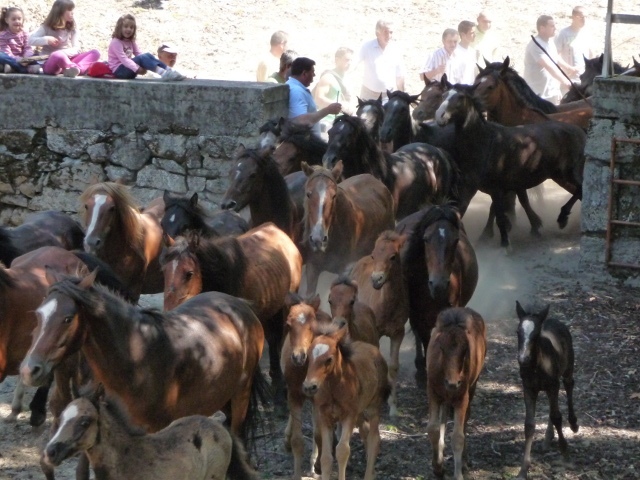 On a happier note, judging from activity in the pen, a new wild horse could well have been conceived, much to the cheering of the crowd and sniggering of the children looking on. What a long and enthralling day … the raw wild-west atmosphere started to wind down about mid-evening, but beers were still being served. We moved the van into a more level bit of clearing and stayed the night there. The forest lay silent once more. Or were those hooves we heard in the middle of the night? This entry was posted in Art & Culture stuff, By Country - Spain, Travel stuff, Wildlife stuff. Bookmark the permalink.